My submission for the Boulder Media art blog under the theme gods and goddesses . and Persephone: Queen of the Underworld, goddess of fertility, youth and spring and the wife of Hades. Persephone, the beloved daughter of Demeter(goddess of growth and vegetation) was abducted by Hades, bewitched by her beauty and youth. Mythology says that the union of the two, Hades and Persephone's marriage, is the reason we experience the four seasons of the year. Demeter, heartbroken and angry brings winter and autumn while her daughter is bound to be with her husband at the kingdom of death but changes into summer and spring when Persephone leaves the underworld to be with her mother for the rest of the year. 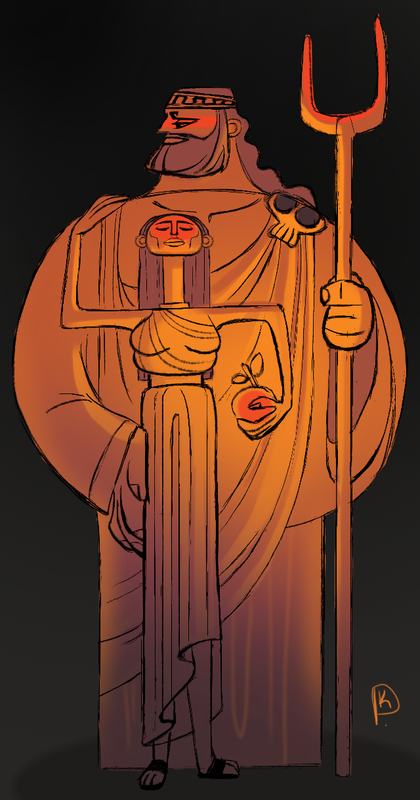 I have always liked this story and I think of Hades and Persephone kinda like Yin and Yang. One represents death, the end of life and old age, the other is a symbol of creation, the beginning of life and youth. negative and positive. balance! Love your drawings and love your style! Hi from Singapore - I stumbled on your blog accidentally but I am glad I did.